Hey there. I hope everyone's doing well. I mentioned a few weeks back that we're trying out a new format for the blog in 2018. Instead of doing an update post every month, we wanted to publish content more often and post updates when we actually have some news. We're also shifting gears a bit with our newsletter. Instead of just rehashing the update posts in the newsletter, we're going to write a quick message and link out to the new content. We're on a less-than-once-per-month pace with that, so please sign up for our newsletter. Even if you hate getting emails, we're not going to bug you very much. I promise. It feels like a day doesn't pass where someone doesn't ask about Gutenberg. We published a couple of articles on the subject of the last several weeks. My favorite is the latest where we compare WordPress to MySpace in the early 2000s. I think the analogy works out pretty well. We released our first feature update for Beaver Themer and added support for translation plugins, The Events Calendar, and Easy Digital Downloads. There's more info on that in our Themer 1.1 update post. If you're still a bit unsure of what Beaver Themer does, this tutorial video about creating an events page with Beaver Themer might help. Even though it's about the new Events Calendar integration, it's a good overview of the power of Themer. Due to very popular demand, we're adding the ability to save and create global columns. Similar to how you can save rows and modules, in 2.1 columns will have the same functionality. Another highly-requested feature has been disabling editing of Beaver Builder pages based on user role. With this feature, you'll be able to lock down pages and prevent certain user roles from accessing editing tools. In 2.1, we're going to add validation to code fields. We hope this will prevent those rogue semi-colons from sneaking through and ruining your day (and vice versa). Also, we're adding a notification center to Beaver Builder. It's going to be minimal, but we're hoping it will help educate users about new features and updates as they're released. We're planning to release an alpha version of 2.1 this week and we'll have an accompanying blog post with a lot more details. 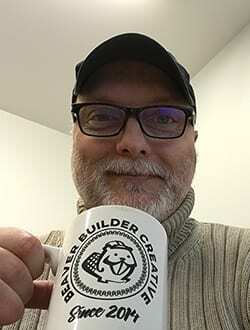 Over the holiday season, we brought another member on to the Beaver Builder team! If you've spent any time in the Beaver Builder Slack, you surely recognize the name Nomad411 aka Gerard Godin. I put a lot of emphasis on our Facebook group, but I specifically promised Gerard I would give a solid plug for the community Slack channel he created. Come by and say hello! Gerard joins us from the Atlantic coast of Canada, “where the air is pure and the sushi runs wild.” When he's not making us feel silly for complaining about the “cold” in California, Gerard enjoys photography—particularly iPhoneography—and participating in various online communities and message boards. Gerard is fluent in English and French. While he recently joined the team on a more permanent basis, he's been working with us for some time now helping manage our translations and translators. After a career in IT, he gravitated to freelancing and decided to apply his knowledge to help small businesses and entrepreneurs benefit from the power of the web and WordPress. Oh boy, this is a really exciting one! We're sponsoring and attending two upcoming WordCamps, Miami and London. Simon and Danny from the team are both based in the UK and, despite working with them for years, we've never met in person. Justin and I are making the trek across the pond for a visit. If you're in the UK and can make the camp, we'd love to meet you too! Tickets are still available. We're working on a more in-depth case study with WPE, but we wanted to share their amazing looking new homepage that was built with Beaver Builder! WP Engine is one of a short list of names that are in the top echelon of managed WordPress hosting. They also recently closed a relatively major round of funding. Nice work, WPE! In the first week of March, Billy, Justin, and I are heading out to Austin, TX to visit with Brent. We really are pushing to do more with video this year, so we're going to try an AMA (Ask Me Anything). You guys ask questions, we'll read them off and answer them together in a video! I think it will be fun. If you have any questions for us, please feel free to leave them here in the comments. We'll also make a post about this in the Facebook group. In the last few weeks, we've published several articles on the blog. To recap, we wrote about why we chose an unlimited site license model for Beaver Builder. Our friend Kevin Muldoon wrote a post about the benefits of white labeling the WordPress experience for clients. Last but not least, Hashim wrote a post about advanced websites you can build using Beaver Themer. To cap off, this is a straight up plug for a good friend of the company and a great product. As we're delving more into video, we've been watching and learning from the folks we're inspired by. Shawn Hesketh creates fantastic WordPress tutorials over at WP101. He is a talented educator and a true craftsman when it comes to screencasts and video. His article about creating quality screencasts has been my goto and we've been a customer of WP101 since our client services days. Just this week I referred a friend to WP101 as she got a new job with the responsibility of managing the company's WordPress site. As always, thanks a ton for your support. If you have any questions for us at all, please leave them in the comments and keep an eye peeled for our upcoming AMA video! Looks like lots of good stuff is on the way as usual. I’m excited to see what’s around the corner. I’m loving the Beaver Themer update so far too. You know what my favorite part is so far? The oh so simple shortcode for the date… Ya, it’s the small things that matter but it makes my life easier. One question though, is inline editing something that’s forced or are we still able to do things the old fashioned way? One of my least favorite feature of other page builders is inline editors, it just doesn’t seem natural to me. I’m so happy columns are on their way too! I’ve been wanting this FOREVER. I just learned from the BB group about setting up a saved row and then calling it from within a column with a shortcode though, that saved me a lot of headache. Still, global columns is much better than that hack method. Cheers on keeping the good work up and always staying on top of the page builder game. BB is still the #1 page builder out there by a long shot. Hey Nick! We played with a few variations for inline editing and ended up with something that shouldn’t be intrusive on the existing editing experience (if we did our job right). It’s there when you want it but otherwise it shouldn’t get in your way. Check it out when the alpha drops and let me know what you think! Great news! The future seems bright! Wpengine site looks sleek, but according to gtmetrix, it takes 25-29 seconds to fully load it. I hope they will optimize it. For the time being it doesn’t serve as a good promotion, neither for BB, nor the hosting company. And we all know, that BB sites can be fast and performant! You can see this yourself if you pop the page open in an incognito browser (i.e., without anything locally cached). It’s pretty darn quick to load. And if you’re looking for a super-smart WordPress consultant to help with this sort of thing, go hire Jon! He knows his stuff. I’ve not come across that testing site before. It’s really useful to see how it breaks down the difference between being visually loaded and fully loaded. Definitely adding this to the testing toolkit! I think the big take away here is Robbie doesn’t have a man bun anymore! Regarding saved columns. Will we be able to stack saved columns on top of each other in the same row? Sometimes there isn’t one module to achieve what I need. So I will combine multiple modules even If I have to set similar settings like URL in each module. I’d love to see the ability to save a group of modules together but not be dependent on their vertical or horizontal orientation. So we will have saved modules, rows, and soon columns. Why not add the ability to save groups of modules independent of columns or rows? At first I though themer parts did this but then realized parts are output by hooks. Not drag and drop like modules. Maybe I’m getting confused by semantics and naming conventions but would love to know more about how saved columns will function. Something that would take this idea of grouped modules much further is if they could at the global level be set to pull from the same post and post data. And be used a loop item in a layout or archive page. Example. Let’s say I want to create how my blog posts are displayed in an archive page but the posts module doesn’t cut it. So I combine an image module, a heading module, a text module and a button module and save to the library. Then set this library item as a loop item that outputs my posts in the design I have specified wherever I’ve placed the saved group. At this point it may be a different library item type that’s not a group, row or column. Gerard has been amazingly helpful to me on the Slack forum. He’s a smart choice for your team. Thanks, Naomi! That’s great to hear. A quick question around the inline editor & user role restrictions. Do you have any plans on making the inline editor something we can restrict, in the sense of “If user is ROLEX, only allow them to edit the inline text – not edit columns, rows, add elements etc”? This would be perfect when building a site for a client, they can easily edit text / images without worrying about breaking the layout etc. Would love to hear your thoughts / how you’ve got it mapped out! That’s a good idea. We would like to improve on user role editing in the future. We’ve discussed a somewhat similar approach, but we’ll keep your suggestion in mind too! Thanks for the reply Robby, extremely interested to see where things head with BB! This is great, we have been working with Beaver Builder for over a year now, launched 50+ websites and it’s a huge success, we’re happy, clients are happy. Keep up the good work. Just a quick question (I felt this was the most appropriate, recent, blog post). Are there going to be any updates to the Beaver Theme in the near future? I’m not looking for bloat, in fact, I’d prefer the opposite — for items to be stripped out. Lately I’ve just been using my own “Beaver Themer” theme built from underscores and UIkit, but would love to see an update to Bootstrap 4 (or a choice of frameworks!) with some more modern navigation patterns. Keep up the great work you crazy guys!! !